Edinburgh: Adam and Charles Black, 1862-63. 16 volumes; 8vo. 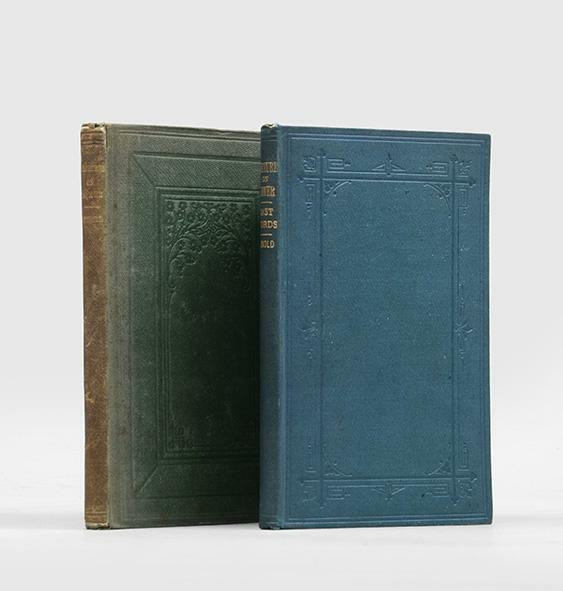 Contemporary dark green half morocco with gilt titles and extra gilt to spines, marbled boards and end papers. Light, very occasional foxing to text, edges foxed; binding a little rubbed, spine to vol.I dulled. A sound set. Shows extremely well. Moscow: tip. V. Grachiova, 1862. 304 pp. 8vo. 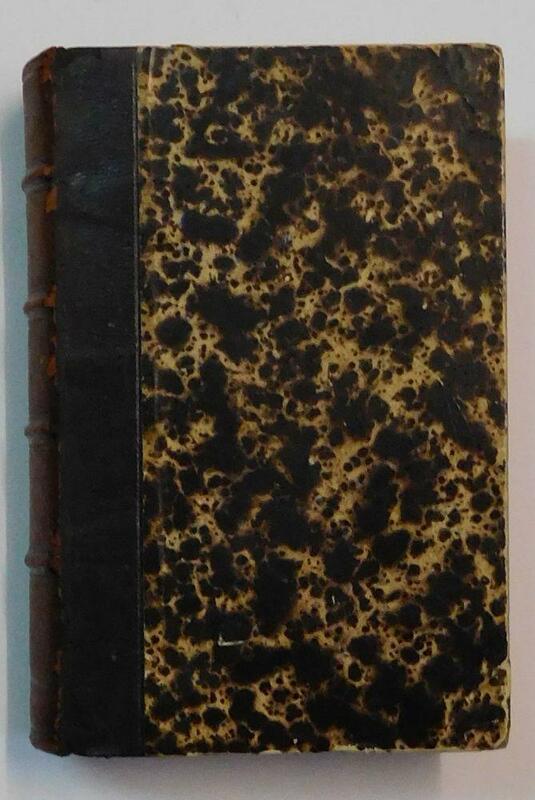 In contemporary half-leather with gilt lettering on the spine. Spine is refurbished, few marks in text. Otherwise near fine. First separate edition of 'Fathers and Sons' by Ivan Turgenev (1818-1883). 'Fathers and Sons' considered to be the most famous of Turgenev's novels. It first appeared in 1862 in Russkii vestnik (i.e. The Russian Herald). 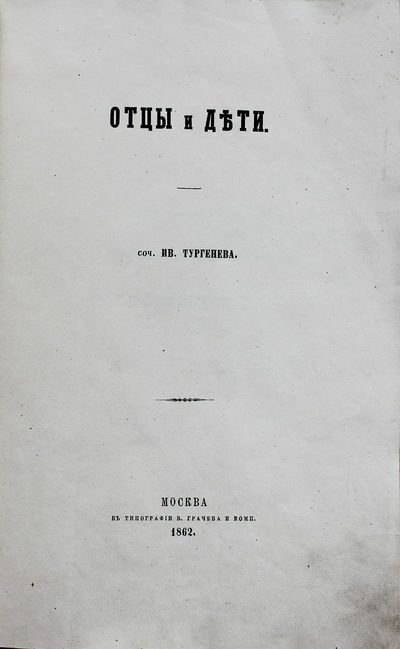 After this publication Turgenev prepared the novel for the separate edition by editing the text: he added dedication to his mentor and liberal critic Belinsky (1811-1848) which served as an important message to friends and enemies and pointed to democratic nature of the novel. He also removed some of Bazarov's unpleasant features (some call him first Bolshevik in Russian literature). In his letter to Gertsen he wrote: Â«...while inventing Bazarov I wasn't angry with him, but felt attraction... I don't feel guilty because of him... it was tough to make him a wolf and yet to defend him...Â». The novel examined the conflict between the older generation, reluctant to accept reforms, and the nihilistic youth. Turgenev wrote that he got the idea for this book on the beach at Ventnor, England, in August, 1860, but that Bazarov was really based on a person he knew, a Â«Dr. D.Â» He finished writing it on his Russian estate in July of 1861, and published it in March, 1862, in The Russian Herald, a magazine that had become conservative. Before this book, liberal Russian critics had praised his realistic depictions of the serfs. But they considered his depiction of Bazarov here to be an attack on liberalism, and reactionary Russian conservatives praised the author. Turgenev, however, stated that he tried to obey aesthetic truth rather than write political propaganda. Fathers and Sons was set during the six-year period of social ferment, from Russia's defeat in the Crimean War to the Emancipation of the Serfs. Hostile reaction to Fathers and Sons prompted Turgenev's decision to leave Russia. Turgenev lived mostly in France and the West, following opera singer Mme Viardot, her husband and children. Turgenev's works were translated into French but it was not until about 1894 that Constance Garnett first translated them into English. Turgenev's style had a great effect on those writers who followed the banners of naturalism or realism. He was praised by Flaubert and Henry James and William Dean Howells. H.C. Richter after J. Wolf. H.C. Richter after W. Hart. South Australia. Constitution, Electoral, and Parliamentary Privilege Acts. May, 1862. Adelaide: W.C. Cox, 1862. Duodecimo, 18, 52, 7 pp., original blue stiff wrappers, signature of J.D.Woods and J. Hindmarsh repeated a number of times, neat stamp for Webster collection; an excellent copy in fine original condition, spine a little frayed, preserved in handsome folding blue morocco box. Very rare: no other copy recorded. A most appealing copy of a rare Adelaide-published legal handbook, printing three early South Australian Acts. This work is of great significance as a remarkably early Australian legal work, the more so as it has the ownership signatures of two contemporary South Australian figures influential in law and politics.The work prints the Constitution Act of 1855-6; the 1861 Electoral Act; and the 1858 Privilege Act. A single copy of a similar but later work is recorded in the State Library of New South Wales (Constitution, electoral, contractors in parliament, parliamentary privilege and issue of writs Acts, Adelaide, 1873), but we have not been able to locate any other copy of this earlier work.With the ownership signature of John Hindmarsh Junior, son of the first Governor of South Australia, who had returned to England with his mother in 1841 and trained as a barrister at the Middle Temple. Hindmarsh returned to South Australia in 1855 where he established himself in practice: the present work would have been a logical addition to his library. There is also the later ownership signature of J.D. Woods, "returning officer for West Adelaide", and known to have been active in the late-1860s and 1870s. Hannover, Selbstverlag 1862.. 3 Tle in 2 BÃ¤nden. Mit 1 Stahlstichportrait. XIII, 384 S.; VI, 1 Bl., 168 S., VIII, 69 S., 1 Bl., 132 S. HLdr. d. Zt. Sabin 4698; Howes B 351; Wagner-C. 380. - Seltene und einzige Ausgabe der im Selbstverlag erschienenen Reisebeschreibung des strengglÃ¤udigen jÃ¼dischen Hannoveraner. - "On considerable interest on California, the Mormons and the Northwest." (Howes). 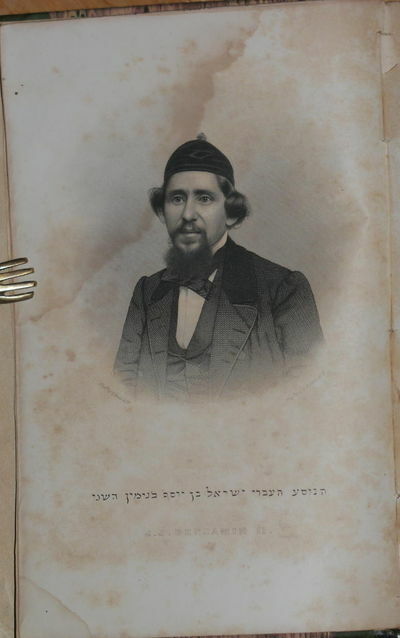 "A good part of Benjamin`s three years was spent in the eastern United States, investigating the history and condition of Jews in North America. He came to the San Francisco area via Panama and then to the Pacific Northwest. He returned overland in 1861 by way of Salt Lake. Benjamin`s fascination with the Mormons is reflected in Part II of Volume III." (Wagner-C.). - Eine Gelenk etwas angerissen. Durchgehend feuchtfleckig. Titel und letztes Blatt jeweils mit hebrÃ¤ischem Besitzstempel. Melbourne: John Ferres, 1862. Foolscap folio, printed on blue paper; blue art morocco. Very scarce official Commission Report. The Enquiry apportions the blame between Burke himself, William Wright, and the Exploration Committee of the Royal Society of Victoria. Bound in with it is the single-leaf Victorian Parliamentary Paper Country discovered by Burke and Wills of 1863. Fine condition. The International Exhibition. - The Nave. Supplement to The Illustrated London News. October 18, 1862. London. Illustrated London News. 10-18- 1862. Large color wood-engraving with additional handcolor, 18 1/2 x 25 inches on sheet size 22 3/4 x 31 1/4 inches, folding as issued to 15 x 9 inches, issued as a supplement with the October 18, 1862 magazine. Overall light foxing, light wear and separations along folds now minimized by professional linen backing. An extraordinarily detailed and attractive view highlighting the intricate architectural features of the Exhibition Palace of 1862, which housed London's second International Exhibition. The nave, depicted here, formed a central axis with an arched filigree glass and iron construction. London: Routledge, Warne, and Routledge, 1862. 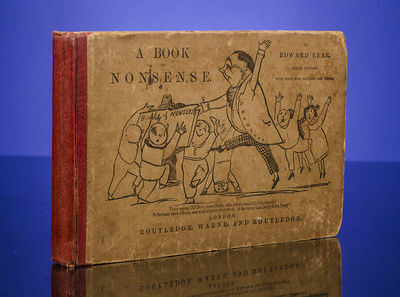 Early Edition of Edward Lear's "Book of Nonsense"
LEAR, Edward. A Book of Nonsense. Sixth Edition. with Many New Pictures and Verses. London: Routledge, Warne, and Routledge. [ca. 1862]. Sixth edition (first published in 1846). Oblong small quarto (5 7/16 x 8 3/8 inches; 138 x 212 mm.). [1, title, verso with publishers monogram], [1, dedication , verso blank],  leaves, printed on one side of the leaf only. With 112 woodcuts after designs by the author. Leaf 73 expertly repaired at blank fore-margin, last leaf with neat strengthening of inner gutter. Small oval blind-stamp of Hale & Howorth, Manchester on front blank. Publisher's quarter red cloth over tan pictorial boards with the title-page Limerick repeated on the front and rear boards. An excellent example of an early edition. "The publication in 1846 of Edward Lear's A Book of Nonsense heralded the arrival of a new literary genre. For centuries nonsense had flourished in the folk tradition of many countries-snatches of it are found in the plays of Aristophanes and Shakespeare, a setting down of the traditional utterances of the Fool. In England such oral nonsense was handed on from generation to generation in nursery rhymes and mummers' plays, and it was not until 1846-at a time when the oral tradition was beginning to disappear-that Old Derry down Derry, the traditional fool of the mummers, appeared as the author of A Book of Nonsense, and nonsense was brought into the literary foldâ€¦The limericks which make up the first edition were written and illustrated during the 1830s, but were not published until February 10th, 1846" (Vivian Noakes, Introduction to Nonsensus, compiled by Justin G. Schiller). Denver: Thos. Gibson, Colorado Republican and Herald Office, 1862. 198pp. Original printed wrappers. Spine dampstained, wrappers somewhat dust soiled. Front wrapper initialed in blue pencil and with lower corner torn away. Internally clean. About very good. 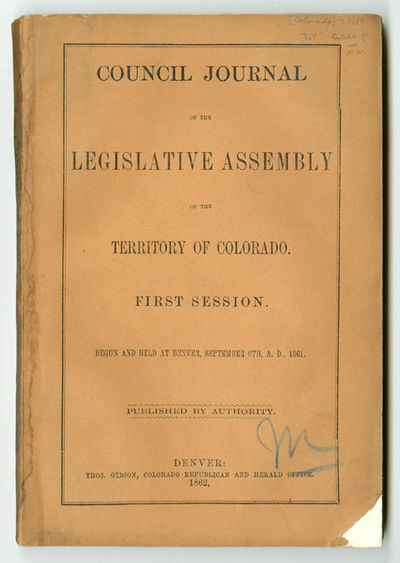 The record of the first legislative assembly of the territory of Colorado and an example of early Colorado printing. McMURTRIE (COLORADO) 28. London: Andrew Sowle, 1862. Second edition. Very Good. Recent, but simple looking rebind, retaining parts of earlier period leather boards. Occasional pencil notation to text, ink notations at front. Pages are a bit toned of dog-earred. 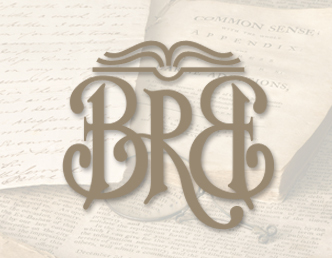 Second edition of what is considered to be the first coherent guide on Quaker behavior. Revised and expanded from the original edition published in 1869. Reports of The Land Purchase Department Relative to The Extinguishment of Native Title. Chapman and Hall. Hardcover. London, 1862. 8vo, publisher's burgundy cloth, 467 + 32 pp. ads dated May, 1862 + 494 pp. A good set in the original publisher's cloth, generally attractive, with some flaws: Front hinge nearly split on first volume (it is barely holding but could be repaired easily), bookplates to pastedowns, fading and slight leans to spine, chipping to cloth at head of spines, bindings shaken. Map in fine condition. Remains an attractive set in the scarce publisher's cloth despite these flaws. Please contact us for additional pictures or information. Sadleir 14 . Good. 1862. First Edition. Florian Ritter von PASETTI (1793 - 1875). HUNGARY / VOJVODINA &#150; TISZA (TISA) RIVER SYSTEM: Darstellung des Theissregulirungs-Unternehmens seit dem Beginne der Arbeiten im Jahre 1846 bis zum Schlusse des Jahres 1860. [Accompanied by:] Stephan WEISS. Uebersichts-Karte des Theiss-Flusses vom Ursprung bis zur Mündung in die Donau mit der Darstellung des Standes Regulirungsarbeiten an diesem Flusse zu Ende des Jahres 1860. Vienna: Reiffenstein & Rösch, 1861. 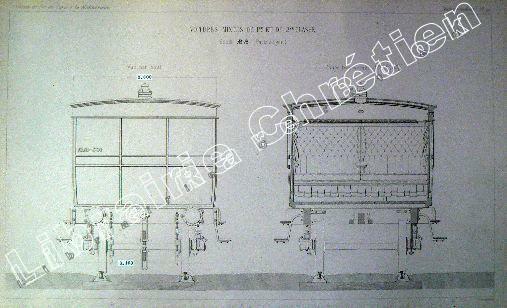 Vienna: K K Hof- und Staatsdruckerei 1862 - 4° (30.5 x 24 cm / 12 x 9.5 inches): 59 pp. + 1 chromolithographed map, original white satin endpapers, bound in original navy blue cloth with blind-stamped designs and title and border debossed in gilt (Excellent condition, nearly mint). Chromolithographed map, dissected into 16 sections and mounted upon original linen (100 x 128 cm / 47 x 50.5 inches), folding into original navy blue cloth-covered slipcase with blind-stamped designs and title debossed in gilt, matching the binding of the accompanying text (Excellent condition, map clean and bright, only minor wear to extremities of slipcase). An exquisite presentation set comprising a large map and report, showcasing the Tisza River, the Danube&#146;s greatest tributary, which has its source in the Ukraine, and then flows through Romania, Hungary and the Vojvodina region of Serbia, focusing on the &#145;Regulation of the Tisza&#146;, one of the era&#146;s great hydrological engineering projects. This extremely attractive and fascinating presentation set focuses on the Tisza River (Tisa, known in German as the Theiss Fluss), the Danube&#146;s mightiest tributary, that for most of its course flows through eastern Hungary and the Vojvodina region of Serbia. Uniformly bound in fine gilt-blind-stamped cloth, this set was evidently intended for presentation to a VIP figure, perhaps a minister or a nobleman, as other known sets do not seem to be bound in such an exquisite manner. The set was made to showcase the first, and most critical, phase of the &#145;Regulation of the Tisza&#146;, an engineering mega-project which straightened the course of the river in order to ease flooding and aid navigation. The set consists of a large, carefully drafted and finely coloured map of the Tisza and its major tributaries, accompanied by a written report on the Regulation project. All considered, the set forms the finest 19th Century work on the geography and hydrology of the Tisza, and indeed one of the most impressive works of its kind issued in all of Europe during the same period. The fascinating text volume, written by Florian Ritter von Pasetti, on behalf of the Tisza Regulatory Company, is described as an &#145;Extract from a report&#146; to the Imperial Minister of Public Works, Josef Lasser von Zollheim. The work is a masterpeice of hydrological engieering litterature, giving a detailed, yet easy to read, insiders&#146; account of one of the grandest projects of its kind ever undertaken in Europe. 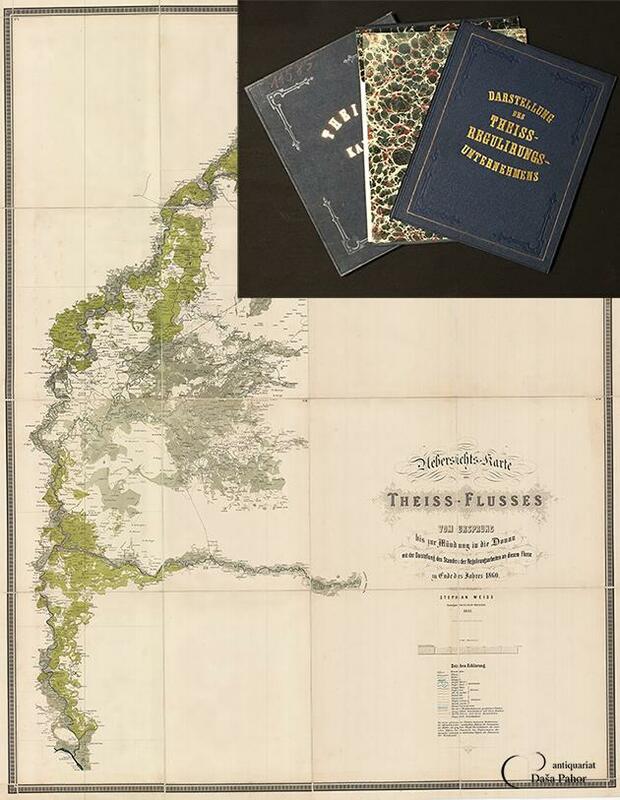 At the end of the work is a beautiful, colourful map of the Tisza watershed, highlighting it major tributary basins, &#145;Croquis der Thiess&#146;, made by the same draftsman as of the large map. The large map, created by Stephan Weiss, a master draftsman of the Austrian Public Works Ministry, is predicated on the best official surveys and blueprints. While entitled in German, it generally uses the local Hungarian nomenclature for place names, and provides a meticulous and precise scientific rendering of the Tisza and its major tributaries. SEE OUR WEB PAGE FOR LONGER DESCRIPTION.References: Jahrbuch der Geologischen Reichsanstalt, Volume 12 (1861), p. 544; Mittheilungen aus Justus Perthes' Geographischer Anstalt, vol. 11 (1865), p. 461; Sitzungsberichte der Kaiserlichen Akademie der Wissenschaften ., vol. 46 (1863), p. 300.
s.l. (Cincinnati / Hamilton County, Ohio), n.d. (1862). Very good antiquarian condition. Small broadside, 8.25" x 3". Caption title [as issued]. Illustration of an elephant head at top of the ticket. Uniformly tanned but in surprisingly fresh state. When was an Elephant first utilized in American politics? Surely the present Union Party ticket must be one of the earliest appearances of it, if not the first. Although undated, it was certainly printed in 1862 when the men listed here were candidates on the Ohio Union ticket; moreover, the canditate for Supreme Court Judge Franklin T. Backus ran only once (and was defeated by Rufus P. Ranney by a total of 6,963 votes). The Union State Convention assembled in Naughten Hall, August 21, 1862, with Benjamin Stanton as chairman (both temporary and permanent). The Union Party officially adopted resolutions that opposed all compromises with the Rebellion, and endorsed the administration of Governor Tod. Nominations: Supreme Court Judge, Franklin T. Backus; Secretary of State, W.S. Kennon, Attorney-General, Chauncey N. Olds; School Commissioner, William D. Henkle; Board of Public Works, John B. Gregory (SOURCE: A.E. Lee, History of the City of Columbus, Capital of Ohio, 1892, Vol. 2, p. 440). 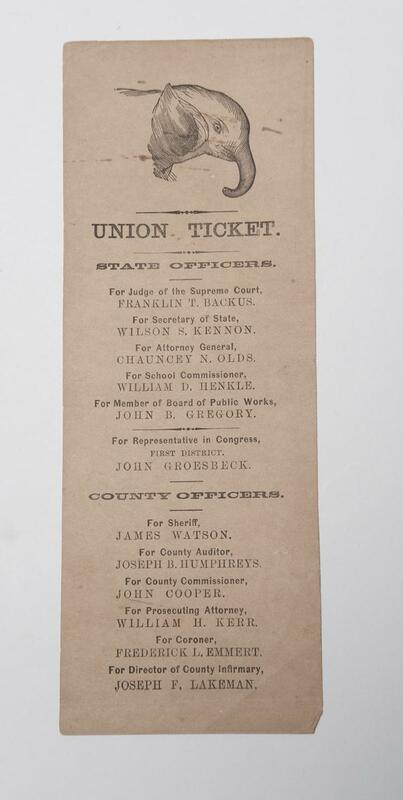 All appear on the present Union Ticket exactly as stated. If our dating is correct, the present Union Party Ticket may have appeared two years before the elephant was used as a political symbol in an 1864 pro-Lincoln "newspaper" (it was more like polical propaganda) entitled "Father Abraham" although it took nearly 10 years for the elephant to be codified as a Republican symbol. In 1874 Harper's WeeklyÂ cartoonist Thomas Nast drew a caricature of the Republican Party elephant being kicked into a pit by the Democratic Party donkey disguised as a lion. The cartoon was evidently prescient, as the Republicans lost control of the House a few weeks after publication. The Union Party was a Civil War era amalgam of Republicans, pro-War Democrats, and former anti-slavery Whigs. 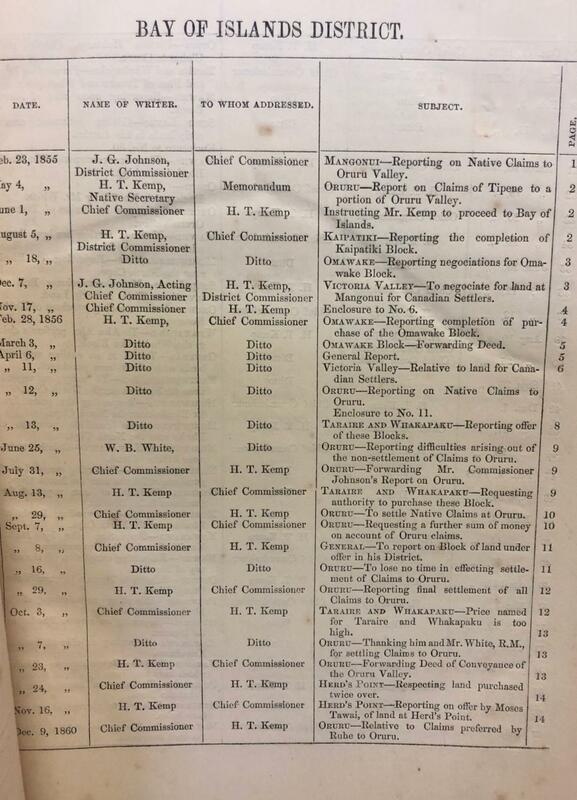 Concerning the present offering, we suggest the place of imprint as Cincinnati / Hamilton County, where Joseph P. Humphreys served as Hamilton County Auditor, and Frederick L. Emmert as Coroner. Literature: p. 440. G.H. Porter, Ohio Politics during the Civil War Period, PhD dissertation, Columbia Univ., 1911.
de 496 pp.. et 10 pl.. Paris, J. Vermot, 1862, in-8, de 496 pp.. et 10 pl., demi-percaline, dos lisse, Deuxième édition, illustré par Hadamard, avec un envoi de l'auteur à son docteur, "reconnaissant de ses bons soins". L'auteur décrit son voyage envers Suisse et le nord de l'Italie, tenant "un juste milieu entre le style exclamatoire, les descriptions de Bourrit et le pédantesque aridité de William Coxe." Cet ouvrage a paru originellement en 1834, mais avec seulement huit illustrations. Quelques rousseurs, plats un peu fatigués. 2 volumes, -L--572 pp. 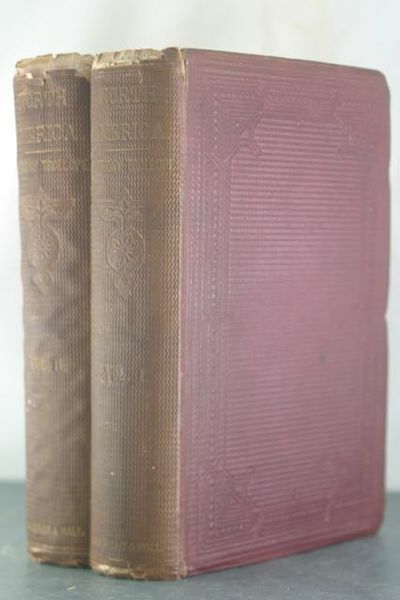 Paris, Dunod, 1862-1874, in-8, 2 volumes, -L--572 pp. + LII-208 pp, 29 pl. et LXVIII pl. (sur 34 feuilles), demi-chagrin noir, dos à nerfs, En tout : 97 planches en héliogravure par Erhard d'après Des Cloizeaux, représentant des perspectives géométriques usitées dans la plupart des traités de minéralogie ainsi que des projections destinées à faire ressortir la position relative des faces et leurs principales zones. PREMIÈRE ÉDITION de cet ouvrage qui accorde une place importante aux caractères cristallographiques et chimiques des minéraux, et à leurs propriétés optiques biréfringentes. Des Cloizeaux (1817-1897) fut titulaire de la chaire de Minéralogie du Muséum national d'Histoire naturelle de Paris, en 1876. Il fut l'un des premiers à appliquer les méthodes optiques à la minéralogie, générant ainsi une nouvelle interdisciplinarité, tout en favorisant l'essor de la pétrologie moderne. Notre exemplaire ne contient pas le 2° fascicule du tome 2, publié en 1893, et comprenant les pages LIII à LX et 209 à 542. Cachet annulé de la faculté catholique de Paris et étiquettes en pied des dos. De la bibliothèque d'Henri Viellard, avec étiquette ex-libris Poggendorff, III-354. d'un frontispice, 55 et (1) Troyes, Dufour-Bouquot, 1862, in-8, d'un frontispice, 55 et (1) pages, exemplaire broché (couverture salie, déchirures au dos), Unique édition de cette étude historique sur l'utilisation de clystère vétérinaire, ou dit "seringue de maréchal" par Coffinet, comme pompe à incendie à partir du milieu du XVIe siècle et jusqu'au XVIIe, au chapitre de la cathédrale de Troyes. En frontispice, l'auteur a fait graver "l'ancienne seringue à incendie" longue de 72 centimètre et large d'un diamètre de 24 centimètre qui porte les armes du chapitre de l'église de Troyes. A la suite, on trouve les différents incendies durant lesquels on utilisa cet instrument à l'usage dévoyé. En envoi autographe de l'auteur "à Monseigneur l'Abbé Leclerc, chanoine secrétaire de l'Evêché". Hormis un brochage fragile, bon exemplaire. Paris, 8 rue de la Paix, 1862, in-12, , , Bel exemplaire de la première édition de cette étude du Mexique à l'époque du baron de Bazancourt. L'auteur nous renvoie tout d'abord au temps des Aztèques pour ensuite nous relater de la situation actuelle de ce pays si complexe par son brassage de culture espagnole et indigène. 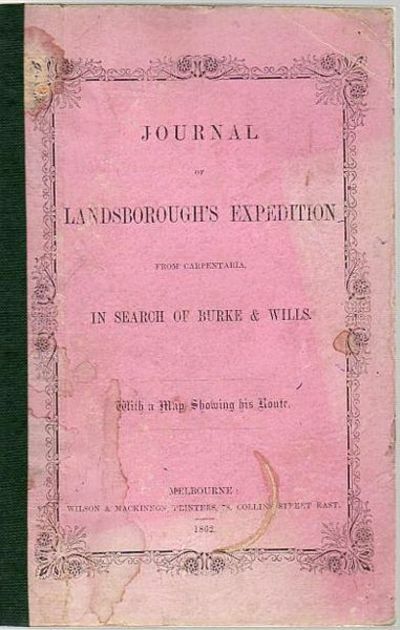 Journal Of Landsborough's Expedition From Carpentaria, In Search Of Burke And Wills. With a Map Showing His Route. Melbourne, Wilson & Mackinnon Printers, 1862.. 8vo; pp. 128; new b/w frontispiece with original protective tissue guard, map is complete; new 1/4 green cloth spine with orginal pink printed boards, boards are worn and stained, light flecking to head page edges, a good copy. Die Armen und die Elenden. 10 Bände in 5 Bänden. Deutsch von A. Diezmann. Autorisierte Übersetzung. Einzige rechtmäßige Originalausgabe in deutscher Sprache. JONGE, Jan Karel Jakob de. De opkomst van het Nederlandsch gezag in Oost-Indië. Verzameling van onuitgegeven stukken uit het Oud-Koloniaal Archief. 's Gravenhage, Martinus Nijhoff, 1862-1909. 18 volumes. Original wrappers (some spines sl. damaged or rebacked, preserving the original wrappers).Volume I-III: De opkomst van het Nederlandsch gezag in Oost-Indië 1595-1610. 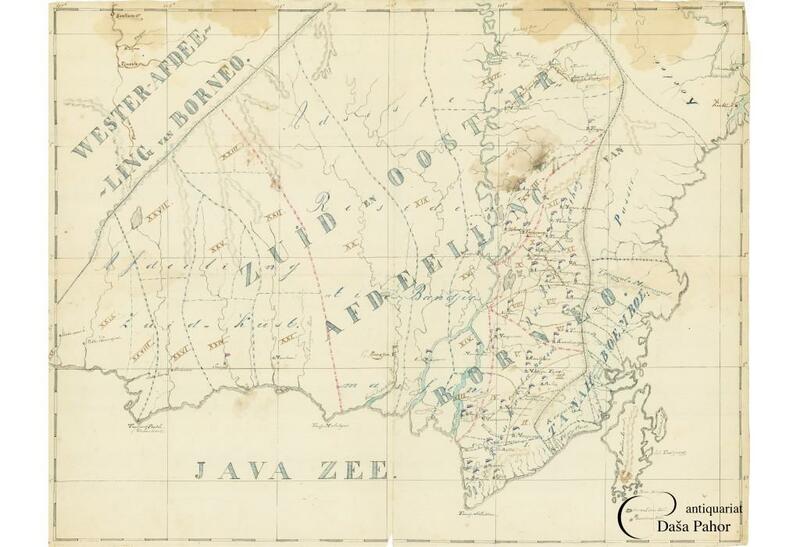 Volume IV-XIII: De opkomst van het Nederlandsch gezag over Java, 1612-1764. Added: J.K.J. Jonge & M.I. van Deventer. Supplement op het 13e deel: Documenten omtrent Herman Willem Daendels, edited by L.W.G. de Roo. 's Gravenhage, 1909. 2 volumes. And an other supplementary volume: M.L. van Deventer. Het Nederlandsch gezag over Java en onderhoorigheden sedert 1811. Deel I. (All published). 's Gravenhage, 1891. And: J. Meinsma. Register op deel I-VII ('s Gravenhage, 1875) & J.W.G. Haarst. Alphabetisch register ('s Gravenhage, 1888). - Rare complete set of the most important primary sources on the history of the East India Comapany (VOC) taken from the Company's rich archives. [Paris, imprimerie de Ch. Lahure], , in-8, , broché, couvertures de l'éditeur, Première édition des deux leçons élémentaires de la théorie de la chaleur formulée par Verdet, professées en 1862 : ces leçons posèrent les bases d'un traité complet, qui sera recueilli par deux de ses élèves, Prudhon et Viollet, et publié en 1868-1872 aux tomes VII et VIII de ses Oeuvres complètes (Imprimerie Impériale), où elles seront reproduites en tête du tome VII. Émile Verdet (1824-1866) enseigna à l'École Normale, à l'École Polytechnique et à la Sorbonne, où il énonça cette théorie mécanique de la chaleur qui présentait, pour la première fois dans la sphère scientifique française, les nouvelles théories physique sur la thermodynamique de Joule, Clausius, Helmholtz et William Thompson. Envoi non signé de l'auteur en couverture, à l'abbé Paul de Broglie (1834-1895), ancien élève à l'École polytechnique (X 1855), futur séminariste à Saint-Sulpice (1867) et premier titulaire de la chaire d'apologétique de l'Institut catholique de Paris (1880). Cachet de l'Institut catholique de Paris. Dos factice, titre manuscrit en long et étiquette en pied. Couverture salie et fragile. Rousseurs. DSB XIII, p. 614-615. Richmond: West & Johnson, 145 Main Street, 1862. Fourth Edition. Hardcover. Good +. 16mo. xxvii, , 168pp. 12 folding plates. Marbled paper covered boards. Leather joints and spine. 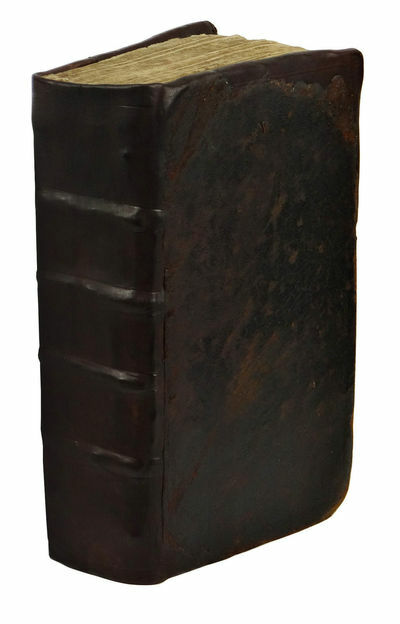 Gilt stamped title on leather spine. Edge wear to boards and light rubs to leather joints. Light shelf wear to marbled paper covered boards. Head of spine rubbed with a small indentation. Slight toning to contents. Scarce Confederate imprint. First published in 1836. Parrish & Willingham 4947. (Cooper, James Fenimore) Darley, F.O.C. Chemins de fer de Paris à Lyon et à la Méditerranée. [Janesville, Wisconsin], 1862. First edition. Very good condition. Handsome broadside/handbill unusually illustrated with a wood block of Tom Thumb's "miniature chariot". The text states his intention to make another US tour, including California, and then on to Australia: "...he has determined to make one more Tour through the United States, including California, after which he contemplates visiting Australia, and returning again to England". He eventually began the world tour in 1869 from New York, and arrived in Australia in 1872. The broadside/handbill advertises a performance of Tom Thumb with Mr. William Tomlin, "the great English Buffo and Baritone from the Nobility's Concerts, London and Mr. W. De Vere, the Celebrated American Tenor. C. G. Titcomb, Brilliant Pianist, Will Appear at each entertainment". The venue is Lappin's Hall, Janesville (Wisconsin) for two performances Saturday and Monday, Jan. 18 and 20 (1862). The bottom of the broadside/handbill features the wood block illustration of Tom Thumb and his miniature carriage, with the text proclaiming, "This Charming Man in Miniature is undoubtedly by far THE SMALLEST MAN ALIVE, of his age. He is intelligent, sprightly, educated, perfectly symmetrical in all his proportions, and graceful beyond belief. HE IS 24 YEARS OLD, AND WEIGHS 33 POUNDS. He appears in a great variety of interesting performances, Imitations, Costumes, Songs, Dances, & c., including Napoleon Bonaparte, Frederick the Great, The Oxonian, Sailor, Grecian Statues, Highland Chieftain, Bobbing around, Villikins and his Dinah, The Court Dress worn before Her Majesty, The Polka, Highland Fling, & c., &c. THE MAGNIFICENT JEWELS, & C., &C. Presented to him by Queen Victoria and the Crowned Heads of Europe, are exhibited at each entertainment." This text is followed by a description of the miniature carriage, "THE GENERAL'S BEAUTIFUL EQUIPAGE" and the gifts given to visitors to the exhibition. At the bottom of the broadside/handbill it indicates that Gen. Tom Thumb "is no longer under an engagement to any individual, but gives his Exhibitions solely on his own account". Admission costs printed at the bottom. While operating independently at this time, Gen. Tom Thumb was signed with P. T. Barnum from age 6, and used Barnum again as the promoter of his world tour. 4 1/4 x 11 3/4". With contemporary folds, light toning on the almost tissue paper, still very bright and desirable. We found no record of it in World Cat or Trove, which is understandable since this is such an ephemeral broadside/handbill. We are delighted that we have the opportunity to own one. London - Chapman and Hall, 1862 Book. Very Good. Hardcover. 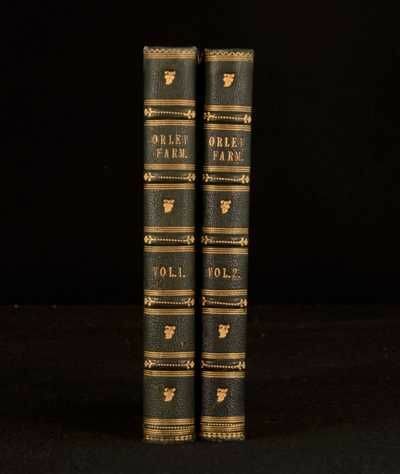 First edition.. Afirst editionset of Orley Farm by Anthony Trollope. 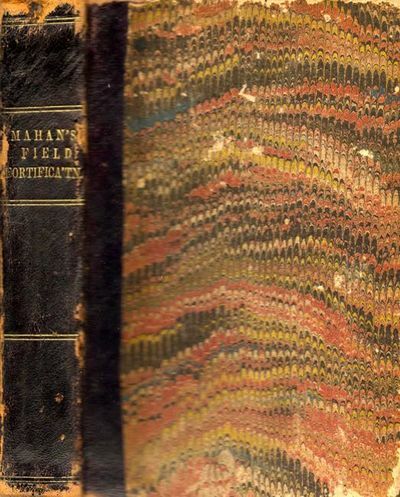 In two volumes. First edition but second issue, i. e. not bound from parts. Illustrations have been re-arranged to volume I with 'And then they all marched' facing p73. The list of illustrations has not been altered, and the comma has been removed. Second volume has not had the list of illustrations altered, a third issue point, with the final illustrations both reading 'Farewell' as in the second issue. (Sadleir)Collated: Lacking half titles and publisher's advertisments. All 40 illustrations present though one misbound to first volume. Orley Farm is a novel written in the realist mode by Anthony Trollope and illustrated by the Pre-Raphaelite artist John Everett Millais. . It was first published in monthly shilling parts by the London publisher Chapman and Hall. Although this novel appeared to have undersoldOrley Farm became Trollope's personal favourite. 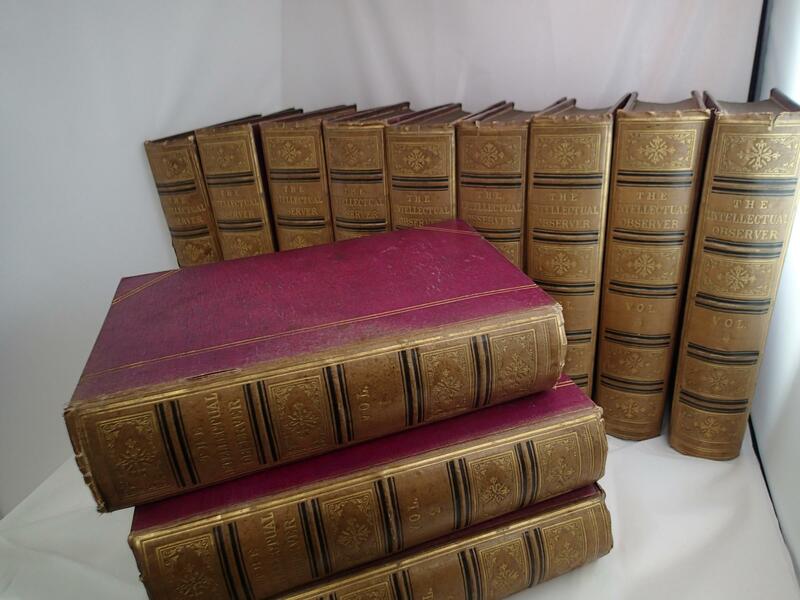 Condition: In half green crushed morocco leather bindings with marbled paper covered boards. Binding by J Walch adn Sons. Externally, smart with slight rubbing. Bookbinders label to front pastedowns. Internally, firmly bound. Pages are generally bright and clean with occasional scattered spotting. Some chipping and loss to later pages of volume II. Plate in volume I has been misbound and suffered chipping and loss. Overall: VERY GOOD..